This is my second post on the topic of baking after writing Introduction to Baking a few weeks ago. 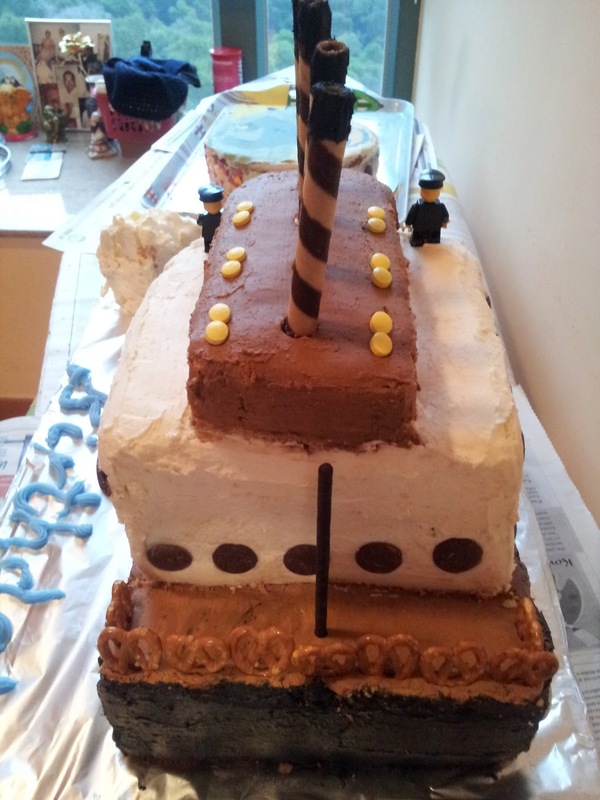 This cake was for my little boy turning 5 who had fallen in love with the greatest ship ever, after visiting a Titanic exhibition in Macau on its 100th anniversary. It was like an exciting, new project for me and as always I started preparing well in advance. I looked up the internet to get ideas about the design and structure. 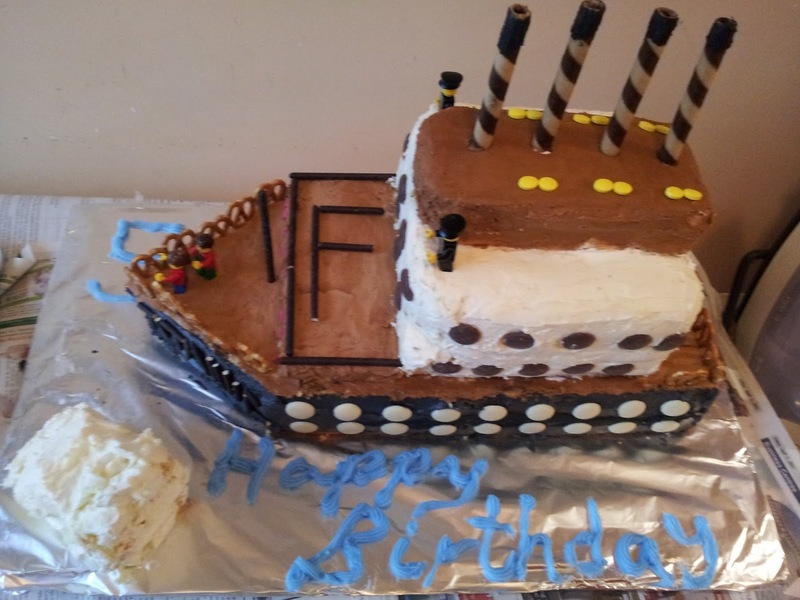 Although there were many general boats and ships available, I wanted to make a design close to Titanic for my son. I printed out some Titanic photographs available and got working on the ingredients to be used. Wherever possible I tried to replace some of the fancy cake decorations with cheaper, easily available local alternatives. Shopping list made I was now ready for the next and more exciting stage – shopping! One visit to the baking store and I had all my non-perishable items in place two weeks before the party day. Things like icing colours, sprinkles, cake board, cake box, candles were bought and kept ready. Next I tried to hunt for edible cake decorations. Something to showcase Titanic’s windows, deck, hull, lifeboats, the lookout and most important and visible – the four iconic smoke stacks! I kept playing and replaying the step-by-step design procedure in my mind to make sure that I did not missing out on anything. With each ingredient bought I felt more and more confident about building this ship. I always like to keep my icing ready in advance specially if it involves more than two colours. I made a simple butter and sugar icing a week ahead, in substantial quantity, judging by the size of the ship that I had in mind. Then I started mixed all my icing colours – black, red, brown and white. Mixing sounds easy but it is a tedious, time-consuming task to get the right shade and it is always better to make some extra so that you don’t run out of colour. Finally the icing was ready and put away in separate glass containers in the refrigerator…awaiting the big day! In the past when I have had to do 3-D cake designs like this one I tried baking my own cakes for the base. However I realised that it takes up too much time and energy, besides the cakes that I need for my ”art-work” should be of a firmer, crumb-less variety and not soft like the cakes I bake. The other disadvantage is the wastage involved when you try to make shapes like these and I hate to see my own creation thrown in the bin. Hence this time round I decided to go ahead with ready-made cakes! 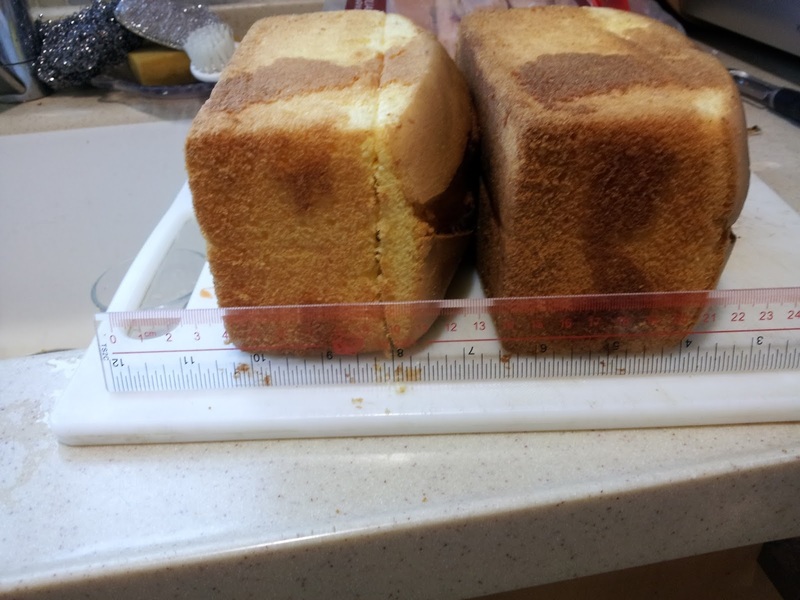 For the base of the ship I bought these simple cuboid shaped, plain sponge cakes (buy Madeira cakes if possible) available at my local super-market. Judging by the size of the Titanic that I had in mind I bought eight of these to stack up plus an extra, just in case. Finally it was the day of putting my plan in action. I quickly dropped off the kids to school and made sure my husband on time too. I had three hours before my younger son returned from his pre-school. My first job was to take the icing colours out from the fridge to get ready at room temperature. I set up my work table laying down old newspapers to make the clearing job easy for later. Next I got out the printed photographs of Titanic and lay them in front of me. Start from the bottom. I trimmed the ready-made cakes to equalise the dimensions and then started stacking them up to build the ship. First side by side and then one on top of another pasting them together using my black icing butter. As I continued stacking I realised I was in for a problem – the cake board was shorter than the size of the Titanic! Now maybe if I had a helper I wouldn’t have panicked as I could have just delegated some of the work. But I didn’t and I had a time-bound job to finish. I tried different available options from trays to cake plates that I had at home but nothing seemed to contain the huge structure that I had envisaged and I refused to compensate on the size. There was other no choice, I had to head out. So I darted out the door grabbing my wallet and sprinted to the local stationery shop. I knew I did not have time to buy a fancy cake board now from the baking shop which was atleast a 40 minute round trip so I drive. So I decided to buy a large cardboard sheet instead! It wasn’t as firm as I would have liked but it had to do for now. Back home in a record 15 minutes I cleaned the cardboard and then wrapped it in aluminium foil. My cake board was ready – plus it was a good 100 dollars cheaper! Board in place, I continued working my way up the ship, trimming, icing and gluing bit by bit till I had a rough structure in place. I made a mental note of doing the lighter shades of icing first next time as starting with the black icing made it difficult to keep the rest of the ship looking neat and clean. Once the base icing was done the fun part started. Tip: Always work in an air-conditioned room to help settle down the icing faster and to keep you cool! This is my favourite part – decorating the cake. I started off with the windows using white and brown chocolate buttons which did their part very well. Next came the lifeboats on the top deck which were created using yellow oval candies. The front and rear deck were fenced using Pretzels which was a last-minute idea but worked really well. 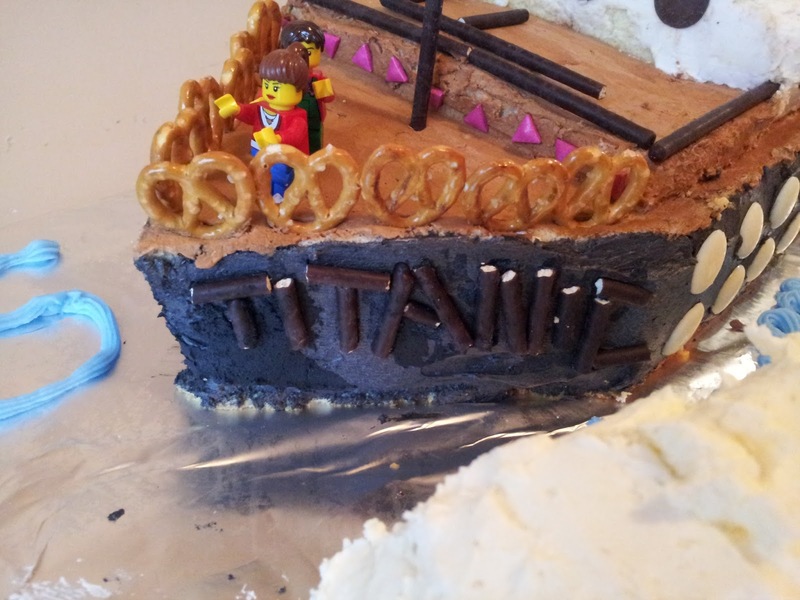 I had bought chocolate Pretz sticks for the smoke stacks but then ended up using them to decorate the starboard, to initialize my son’s name and also to write TITANIC on the ship. The final and the most important part was using the chocolate waffle sticks for the smoke stacks, which gave it a real Titanic feel. That done – it was time to get going to school! Tip: Start putting your decorations on the cake before the icing firms up. By the time we reached home from school I don’t know who was more excited – my son or I? We both dashed into the room where the Titanic was built and I wish I had a camera to capture the reaction on his face when he saw it. Big eyes open in wonder followed by the biggest smile I have ever seen, the first thing he said “Can I play with it?” My objective was accomplished. Later he made his own contribution to the ship, which were quite significant and added to the overall look. Jack and Rose, using his playmobil toys and also the lookout officers saying “Iceberg right ahead!” were all “important details” that Mummy had left out! But the most important detail that Mummy had forgotten about was the iceberg, which was later created using some left over cake, white icing and put on one side of the cake board. Please do take a minute to notice it! Tip: Make sure you have a big enough refrigerator at home before you conceptualise these kind of big plans for a cake. Our Titanic had to be left in that same room with the aircon at full blast!